Are you flying across the world for Thanksgiving break? Or maybe you’re not planning to leave your dorm for five days? In either case, we hope that you’ll contribute to this year’s Tofurkey 2017 Map, a tradition started by former Post-Bac Fellow Victoria to document where and how Smithies are spending the holiday! We will post updates to the map, or you can check the 2017 map yourself. 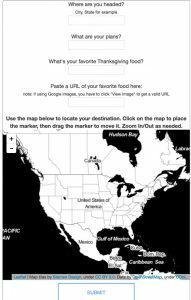 Click the image above to see a static 2016 Tofurkey Map!